CoLOS® Enterprise 5.0 is state-of-the-art software and part of a scalable suite of standard software and networking solutions. CoLOS® Enterprise is an open, flexible software that combines both CoLOS® Create Professional, for message design, and CoLOS® Control, for networking multiple printing equipment. 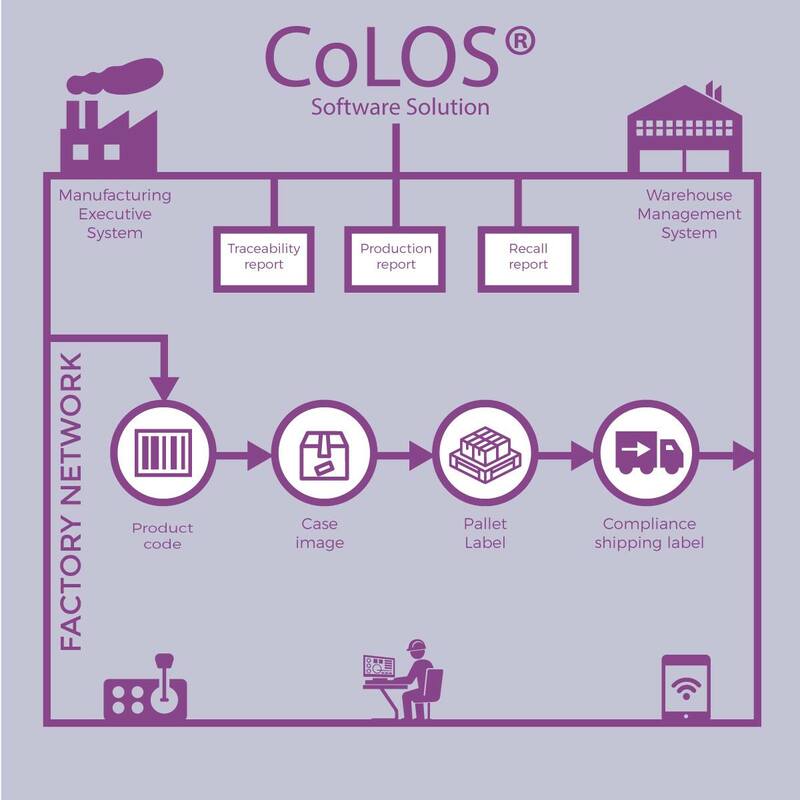 CoLOS® Enterprise allows linking, managing and operating all printers throughout the plant. It contributes to ensuring product data integrity and optimising coding activities. It helps secure centralised data management systems capable of meeting a wide diversity of needs. Message design - Complex message and label creation from a user-friendly interface on your office PC away from the production floor. Central data management - Central management of a unique base of messages and labels. Link to your CoLOS® Enterprise database allowing the retrieval of all production batches. CoLOS® Repository maintains and archives label templates. Secured production batch start up - Secured selection of data to print by reducing human input and automating the tasks. Printer coordination by group when starting production batches. - Easy connection to your existing database via standard Open DataBase Connectivity (ODBC) interface. - Optional Open Protocol Connectivity (OPC) support helps users integrate production control systems (3rd party software). Scanners, camera’s check weighers and Human Machine Interfaces (HMIs) can be connected to CoLOS® via Pyrotec software. Track and Trace - Can be achieved through the integration of barcode scanners and human-readable text cameras via Pyrotec software. No “real-time” data availability to drive productivity. No visibility – which product is being produced on which packaging station? Incorrect Best Before End (BBE) date codes printed on packs. No ‘traceability’ - trace production back to raw materials. Link production plan to CoLOS®. Link all packaging machines to CoLOS® via coders. Gather and report “real time” data from packaging stations. Calculate and display “production end time” based on actual production speeds. Track and trace can be achieved by linking batch details to production/supplier. Improved PSL & volume fill. Reduce workforce in packaging area – 10% by more accurate scheduling, better production visibility and better asset utilisation. Alert FLMs/schedulers when machines are down >3 mins, allowing changes in scheduling. The packaged coding software is dedicated to message design and printer network control while reducing packaging costs, optimising product coding activities and meeting regulatory compliance. Pyrotec PackMark offers a wide range of innovative software applications engineered to complement our coding equipment. CoLOS® software is compatible with all Pyrotec PackMark coders. Easily design simple messages composed of few lines of text (date, lot, time) with no training. Transfer the messages to the printers via Ethernet network or a USB memory stick. Link to the database to feed message layouts with product information. Centrally manage a unique base of messages on a secured server and link to your enterprise database allowing the retrieval of all product information. Secure the selection of data to print by reducing human input, automating tasks and coordinating the start of multiple printers for a production batch. Pyrotec PackMark CoLOS® Traceability software for packaging lines can help to minimise diversion and counterfeiting or product recall and non-compliance fines with prepackaged sets of functionality which meet the unique needs of operators, supervisors, analysts and maintenance personnel across a wide range of industries. Fully integrate into product handling devices, weight scales and Programmable Logic Controllers (PLCs) for automated error handling through Open Protocol Connectivity (OPC). Generate a report of critical production information. Generate or use customer supplied SSCC/LPN codes to identify each pallet with a unique code. Automatically handle all types of pallets (full, partial, multiple stack and exceptions). Identify pallets from multiple palletiser lines and manage the queue from palletiser to label applicator. Minimise coding errors and reduce rework through verification scanner and vision systems, ensuring codes printed on the packaging are correct. Visualise production reports for all coded products and optionally link to your Enterprise Resource Planning (ERP) or Manufacturing Execution System (MES). Ensure compliance with customer and regulatory requirements to reduce fines and penalties. Generate a unique code or “fingerprint” to be printed on each traceable unit. Then, track which “fingerprints” are packaged together and assign a new “fingerprint” to the next packaging level (ultimately tying which product units are in which pallet). Store relevant information to track the product both one step up and one step down the supply chain. Fit your packaging line workflow with a minimal impact on your productivity. Protect brands from the harmful effects of product recalls, counterfeiting and unwanted diversions.